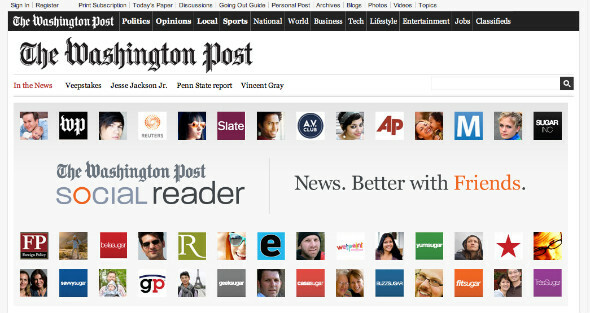 The Washington Post’s social reader is soon to hit 28 million downloads, according to the Post’s executive producer for digital news Cory Haik. In her keynote speech to the news:rewired – full stream ahead conference, Haik said the free app, which was launched in September last year, has experienced “explosive growth” in its first year. The app “was developed with the simple thesis that you want to know and read what your friends are reading”, she explained. It’s a free app that lets users experience news on Facebook. It was built by WAPO labs, a digital team of the Washington Post company that is focused on experimenting with emerging technologies. The app is powered by proprietary technology that personalises and aggregates news. She said content provided on the platform is from the Washington Post as well as a number of other media outlets such as Slate, The Root and Foreign policy, with more than 80 content partners involved. “All the content is hosted on Facebook, so the news experience is seamless,” she added.